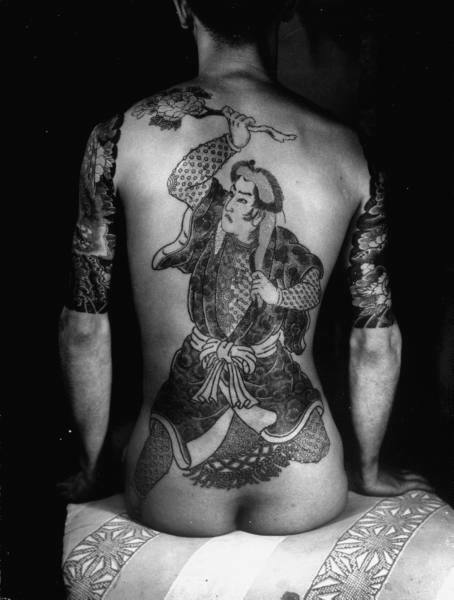 Although the ’30’s have been called the “Golden Age” of tattooing, it would seem to me that, just based on the basic numbers, this is actually the Golden Age of tattooing. Tattooing has never been more popular in modern society than it is now. In search engines across the board on the Internet it has rarely left the top ten searches in the last decade. In 2002 the term tattoo hit it’s highest ranking of number two in the search engines. In 1936 a Life magazine article estimated that 10 million Americans, (6%) had at least one tattoo. A 2003 Harris poll indicated that the number has risen to 16%, or around 30 million by 2003. Now when you add that to the broader range of artwork that is now available to tattoo enthusiasts over the last few decades, I would go out on a limb and say that we are living in the Golden Age of tattooing right now. Makes you feel a bit special, doesn’t it? Tattoo choices themselves have seen a mercurial shift as well. During the “reintroduction” of tattooing brought back to the west by Captain Cook, and the first tattoo craze of the modern era, nautical, and military themes were the rage. During the Industrial Revolution you were pretty much limited to flash, or as one famous tattoo artist was rumored to have said back then, “If it ain’t on the wall, I don’t do it!” At this time the most popular choices were oriental dragons, skulls, hearts (usually with MOM in the banner), and “pin up” girls in various stages of undress. As the ’60s and ’70s came around several college educated artists began to look at tattooing as a means of expression, and a way to avoid the “starving artist” gig. Bringing with them more innovative techniques and styles it became a little easier to get custom work done and the art soon saw a change in popularity as peace signs, marijuana leafs, and the Zigzag® man took center stage for a bit. The ’90s saw The rise in the popularity of the portrait. From realistic renderings of members of the client’s family, to pop icons and celebrities ranging from May West to Kiss. All of which leads us up to our current decade. OK. Pecker contest aside, what do I think the most popular tattoos are? Easy. The tattoos that you feel good about getting. The ones that make you proud to own. Those are the most popular tattoos.